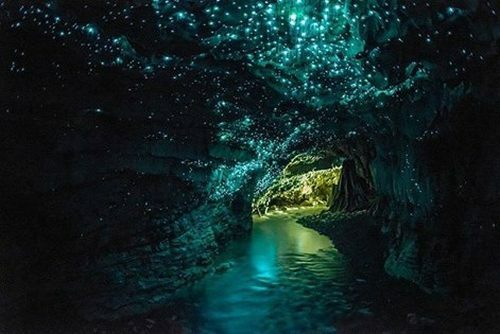 Air New Zealand is offering 70 tickets from Vancouver to Auckland, New Zealand for the price of $777 CAD roundtrip including taxes. The tickets are being offered as part of an 'in-store' promotion with Flight Centre, and there is also going to be a meet-and-greet with some of the players from the famous New Zealand All Blacks rugby team (the Canada Sevens rugby tournament is this weekend). I have confirmed that these will be non-stop flights, which makes them a pretty incredible deal, considering that the cheapest non-stop flights from Vancouver to Auckland between mid-March and October 2017 currently range from around $1750 to $2100 roundtrip. I have also confirmed that the maximum of 2 tickets you are allowed to purchase does not have to include one for yourself. However, both tickets must have the same itinerary (same dates and flights). Keep in mind that New Zealand's seasons are reversed from ours. Showing up in person is the only way you can book these tickets. Since there are 70 tickets available, and you can purchase a maximum of 2, I'm guessing that it's essentially the first 30 or 40 people in line that will be able to purchase these tickets. 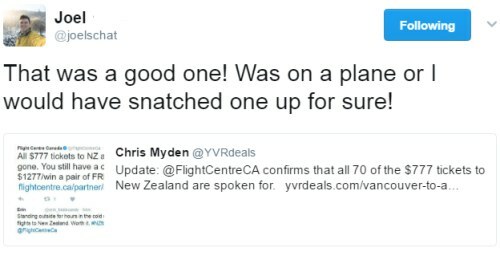 2 Responses to "Vancouver to Auckland, New Zealand - $777 CAD roundtrip including taxes | non-stop flights, 70 seats available"
This kind of offer is absurd. This method of acquiring tickets is like a raffle but they don't call it that. I would think of it more as a door crasher. Like on Black Friday. Doesn't seem that absurd.